Malborne United Under 15s clinched the Peterborough Youth League Division Two title in some style yesterday (May 22). Matthew Driscoll’s side hammered Pinchbeck United 7-1 in their final game to finish one point clear of Feeder Soccer at the top of the table. Jordan Giddings led the way on the scoresheet yesterday with three goals to take his tally for the season to a whopping 63 goals. Freddie Mart-Freeland, Seeraj Gohil, John Halonka and Ethan Burgess compeleted the tally. 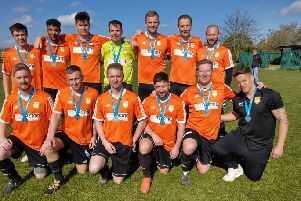 The title win made up for Malborne’s disappointment in the League Cup final, where they lost to Division One table-toppers Deeping Rangers. Feeder Soccer won their last game 3-0 against Ketton through goals by Cameron Guest (2) and Jordan Lee.